Library Staff Week : Getting ready for tomorrow's libraries! Sharing, exchanging, working together! Getting ready for tomorrow’s libraries! The URCA University Library in Reims is pleased to invite academic libraries colleagues to share working experiences and best practices. The event is organized by the University Library staff. The program will include workshops, presentations and library visits, so that colleagues would be able to pick up new ideas from different libraries. All attendees will be asked to contribute to the sessions to add value to the programme by sharing a short presentation of their activities (10 minutes). Located 50 minutes from Paris and 30 minutes from Charles de Gaulle Airport by train, the URCA has a privileged position, in the middle of the Champagne vineyard. Some guided tours will also take place to show you the lovely city of Reims and its Champagne cellars. The library will cover the costs for welcome coffee, lunches, visits and tours. 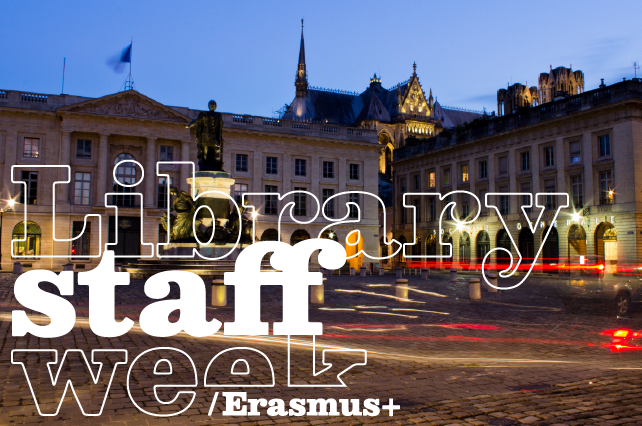 You can apply for the URCA Library Staff Week by filling the attached application form and sending it by e-mail to bibliotheque.universitaire@univ-reims. The applicants will receive a confirmation email before March 18th, 2019. As accomodation is not provided, applicants will also receive hotel recommandations. Working language will be English, but you might also improve your French. We are looking forward to welcoming you in Reims next summer!